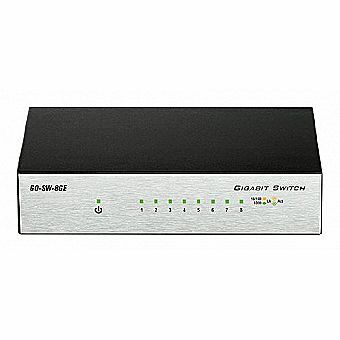 The GO-SW-8GE 8-Port Unmanaged Gigabit Metal Switch was designed for the tree hugger in all of us! It's part of D-Link's new series of SOHO devices. D-Link's Green Technology provides energy savings, reduced heat, and a longer product life without sacrificing performance or functionality. An energy-efficient power adapter (EnergyStar Level V qualified), minimizes use of harmful substances (RoHS compliant), and recyclable packaging make this switch truly environmentally friendly. Intelligent cable diagnostics for efficient troubleshooting.